The BBC governors have upheld part of a complaint against a journalist who said she "started to cry" as a dying Yasser Arafat left the West Bank in 2004. Her comments "breached the requirements of due impartiality", they ruled. Barbara Plett was initially cleared by the head of editorial complaints over the From Our Own Correspondent report on Radio 4 but a listener appealed. The ruling related to her description of a scene when the Palestinian leader was flown out of his compound. "When the helicopter carrying the frail old man rose from his ruined compound, I started to cry," she said in the 30 October 2004 broadcast. 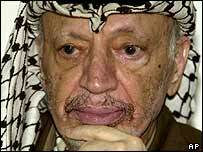 Yasser Arafat died on 11 November 2004 at a French military hospital in Paris. Ms Plett's piece led to hundreds of complaints from listeners. The BBC Governors' Programme Complaints Committee upheld part of the appeal. The committee rejected the assertion by the person who appealed that the report was a "tearful eulogy" and a "flagrant violation" of editorial guidelines. It said Ms Plett's report was balanced by references to Mr Arafat's "obvious failings". But the governors concluded that the reference to crying did breach the guidelines on due impartiality. The BBC's director of news, Helen Boaden has apologised for what she described as an "editorial misjudgement". She said it appeared Plett "unintentionally gave the impression of over-identifying with Yasser Arafat and his cause". The governors said they approved of the "rapid and comprehensive way" in which Ms Boaden had apologised to those who were offended.